THE PROBLEM IS THE OCEAN! The world’s oceans! Nearly four-fifths of our planet’s surface is covered by water. Always changeable and movable, water as a mysterious living being for thousands of years attracted people. Ancient water roads people overcame space in the water to search for food, striving to penetrate into the underwater world and to know him. However, armed with special underwater equipment, the conquest of the ocean depths remained only a dream. 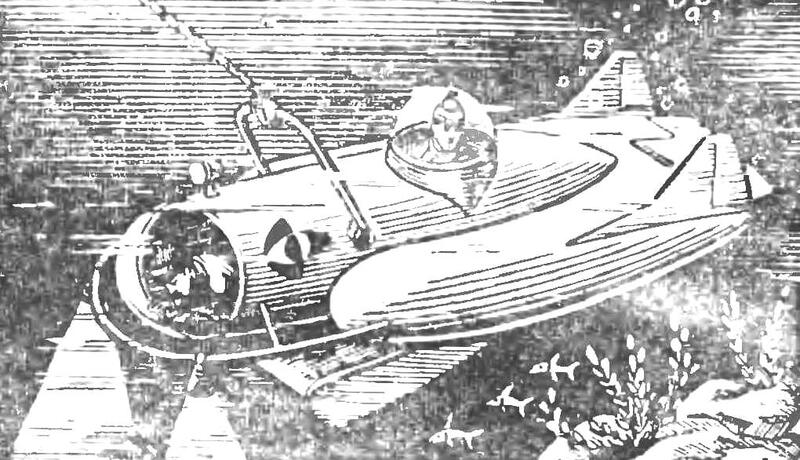 Only about a century ago appeared the first “serial” submarines. But they were intended solely for fighting. 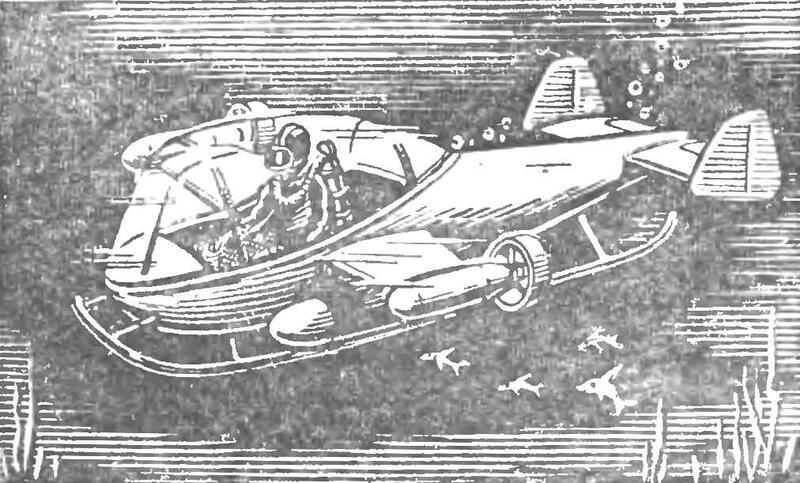 Scientists were able to descend into the depths for scientific purposes only in specially designed vehicles — batisfera, submersibles or heavy diving suits. And this is not a perfect device: submersibles is extremely difficult and the road, divers “attached” to the vessel is severely restricted in movement and manoeuvring. With the invention of lightweight diving equipment way to the sea floor became available. Armed with snorkels and masks, flippers and respiratory tubes, in our days under the water rushed a: athletes, explorers, hunters, photographers. Here we are talking about the devices, so to speak, personal. 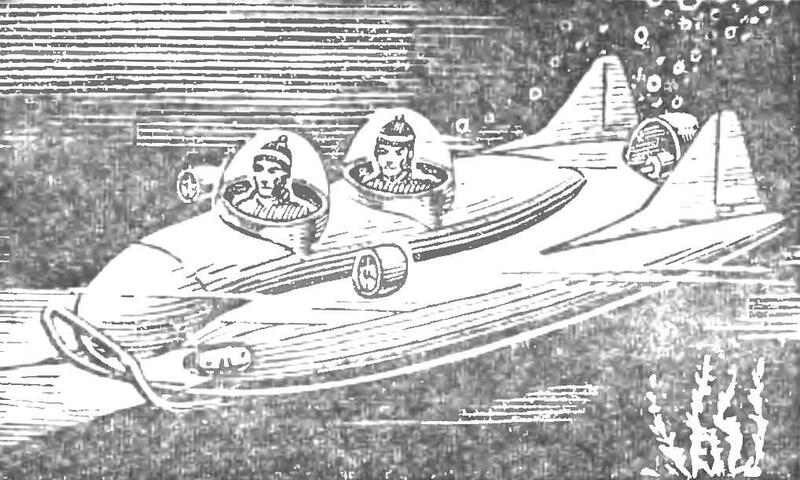 They expanded the capabilities of the person under water, but did not provide it with sufficient speed, the minimum needed for research equipment, cruising range. Finally, just didn’t protect him from the menacing marine predators. For scientific research related to the development of the ocean, created and operate special equipment, such as underwater house laboratory and diving facilities. Now there are over 100 species of underwater vehicles and systems research purposes. However, most of them have a real interest purpose: the devices have to be put “on a trick” when they designed the tasks to be performed. What is the best way to go design idea, which principle should form the basis for the creation of a convenient, versatile, efficient apparatus for underwater research? It may seem curious that the answer to this question in this case, we found not in a lab of the venerable scholar, not in KB famous designer, and one of the youth team of studiesto divers. Introducing: the Komsomol youth creative group “Problem — the ocean.” Organized in the “bowels” of SECB is a special experimental design Bureau of commercial fisheries in Kaliningrad, acts as an integral part NTTM, operates under the motto “Five-year plan — shock work, craftsmanship and the search for the young!”. Here, so to speak, “calling card” of these guys. 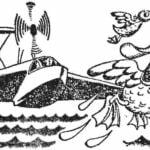 While a small but determined and militant organization of young researchers and engineers, obsessed with the idea of conquering the ocean depths. It is impossible to talk about technology, which is trying to create, not speaking about the people, about the original creative team. 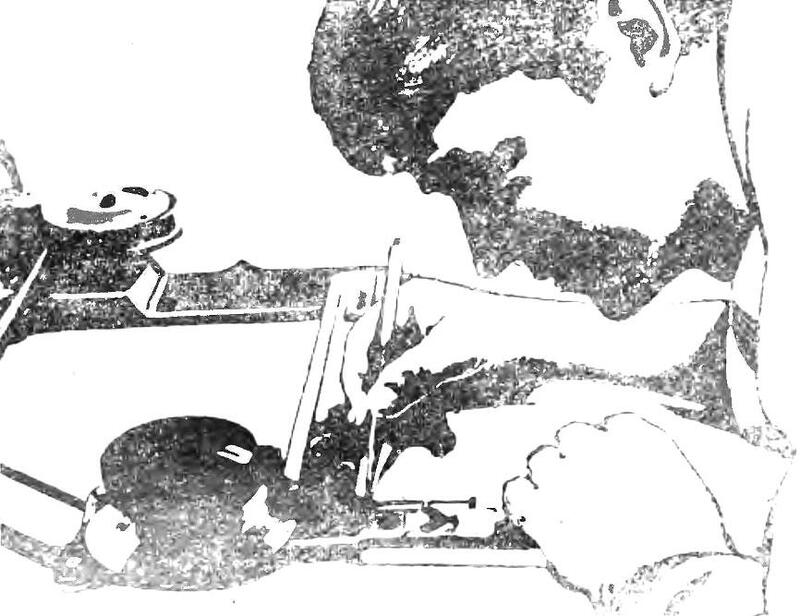 The initiator of its organization by the Committee of the Komsomol. The idea was warmly supported by the October district Komsomol and its first Secretary Vladimir Krutikov. At the head of the case were the engineers, SECB Komsomol Alexander Stetsurin and Anatoly Tuchynska. The meaning of any business is determined primarily by its content. — Organizing creative design group, we mean primarily involve the effort of the youth of our KB to the solution of urgent problems of the technology of commercial fishing, says Stetsurin. — And, of course, to create possibly the most effective system of participation in scientific and technical creativity of all age and professional categories of the Youth of our organization. The first and main problem the boys put up a study of the use of special underwater equipment for the commercial fishery, its design and construction. And lead the whole thing decided not closed, locally, and, conversely, to maximize the knowledge and skills of a wide range of professionals to draw their attention to the problem. The theme of the work of the creative team, SECB is not associated with any harsh conditions, the children are given complete freedom in the choice of objects of study and design, and shapes the direction of the search. The project of “dry” apparatus of Autonomous navigation. It’s ridiculous to expect productive career in science or engineering without knowing what is already created in the scope of undertaken studies to us, — says Anatoly Tuchynska. We started by studying the experience of creation of underwater vehicles in the different countries. Sought to identify and evaluate existing ideas that may be useful in the development of new devices in our environment. Calculate the terms in which it is possible, in our view, to implement this or that idea “in the volume”, given its technical level, or rather, possible at the same difficulties. Pretends, of course, and costs to make sure that they were smaller. — Creative team, of course, does not have its own laboratories, experimental or pilot plants, — says Alexander Stetsurin. But the leaders of SACB created us all the opportunity to conduct development and testing in any of its units. This is because the study group “Problem — the ocean” are considered as integral, though unplanned, part of the work of the entire team. Group members can work on creative themes stands out even one day a week. Therefore, schedule time management group we coordinate with the heads of departments, approved by the chief engineer. What aspects of life the creative team, the emphasis in the group “Problem — the ocean”? To qualify for participation in the work of any employee of KB under the age of 30 years. But here not all: the main criterion for admission is the high professional level of the young specialist, self-discipline, continuous replenishment of knowledge, participate in inventive and rationalization work. The copyright certificate on the invention or rationalization proposal — a kind of membership fee to participate in the work of the group. These guys have a lot of respect of the NOTES, clearly defined, technical and scientific information In the group allocated to “responsible for establishing contacts” with specialists in various fields of science and technology that organizes, when required, research and design with their participation. Interesting organizational structure of the group “Problem — the ocean.” The group elects its own center of the permanent governing body. Any member can be elected its Chairman. The quantitative composition of the center is set depending on the specific situation and status in the group. Here there is an organ — information sheet. The whole KB team learns from him about the Affairs of the creative team, the innovations of science and technology on their profile, creative search and discoveries of the young. But back to the practical Affairs of the group. What is the scientific and technical concept for young researchers? In one year mankind now receives from the World ocean approximately 56 million tons of food that is 0.3% of its reserves. In General a negligible part, but it turns out many valuable species of fish and marine animals are already in danger of total destruction. Explicit, though, and forced reduction of their catch has forced experts to think about the underwater projects of the farms. Project “wet” apparatus of Autonomous navigation. Concern is the inevitable reduction of mineral, oil and gas on land. This reason also makes scientists from many countries to look closer at ocean. So, on the agenda stands the exploration and development of subsea fields. And to do this, first you need special equipment — a mobile underwater vehicles. Convenient, economical, universal. But how easy is it to combine simultaneously to at least two such qualities, as flexibility and efficiency? It turns out, not at all! As a rule, the first condition tends to oppose the second. Here is a trivial example. Go at least to the normal radio shack. Pay attention to ordinary domestic radio and television equipment. Teleradiocompany is always worth much more expensive just on the TV or radio in the same class. Not to mention the bulkiness of these combination devices, are not always drawn to the aesthetics of their design, etc. And involuntarily the question arises: is this the best solution — combine-monolith? Analyzing the experience of creation of underwater vehicles, the guys from the group “Problem — the ocean” came to the conclusion that it may be the best way of modular design. The meaning of this concept is very simple. It creates not a single monolithic device-the universal and the individual nodes. The principle is the same as, say, a car designer. Basis alone: chassis with cabin. But Natalya on this chassis, different bodywork alternately, you can collect a truck or a refrigerated truck, dump truck or crane. Having a kind of “constructor” for the construction of underwater vehicles that could quickly assemble any machine and for any specific intervention works. A set of parts and components, United by a common functional purpose, is called a module. 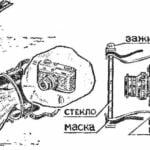 Means, with respect to “designer” to build underwater vehicles it can be, for example, crew module, propulsion module, power module, which, in turn, consist of smaller parts boxes. The obvious advantage to modular construction is the ability of continuous improvement of underwater vehicles, simple and quick repair by replacing worn or obsolete modules, and boxes. This fact alone can minimise the vehicles and thus make them the most cost-effective. The project of “dry” unit, towed a fishing vessel with trawl. Group “Problem — the ocean” set the goal of developing a “designer” for underwater vehicles of the continental shelf, i.e. the coastal zone, the depth of which does not exceed 200 m. This zone is today of great interest primarily because of its relatively shallow depths holds much of the biological resources of the ocean, the richest reserves of oil, gas, and many minerals. Firstborn series, designed for young people of Kaliningrad should become permeable (filled with water), the device carrier. On Board people will be able to stay in the light diving equipment. The device can operate in three modes: towed, self-contained and self-propelled with the power cable. It is noteworthy that the drafting of technical specifications for underwater vehicle, the determination of its tactical and technical characteristics was preceded by an unusual study of the issue. It consisted in synthesizing the opinions of leading specialists in various branches of engineering and science on the topic. The guys made up a questionnaire and asked to answer her questions hydrobiologists and ichthyologists, engineers, shipbuilders and oceanographers, fishermen fishers and people from many other disciplines. Of respondents more than one third are doctors and candidates of Sciences. Here are the opinions of some of them. Chief designer GIPRORYBFLOT A. N. Dmitriev: “Begin design and construction of underwater vehicle”. Such statements — most. And they are very similar: people of different professions need light submersible carrier. The idea is not new in principle: in No. 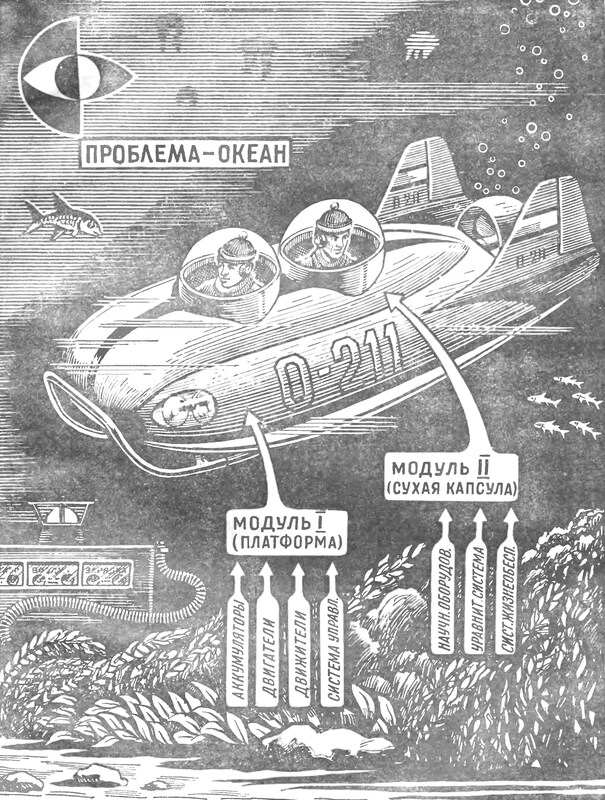 1 of our magazine for the year 1968, we introduced the readers with a light submarine “wet” type, created by students of the Moscow aviation Institute. 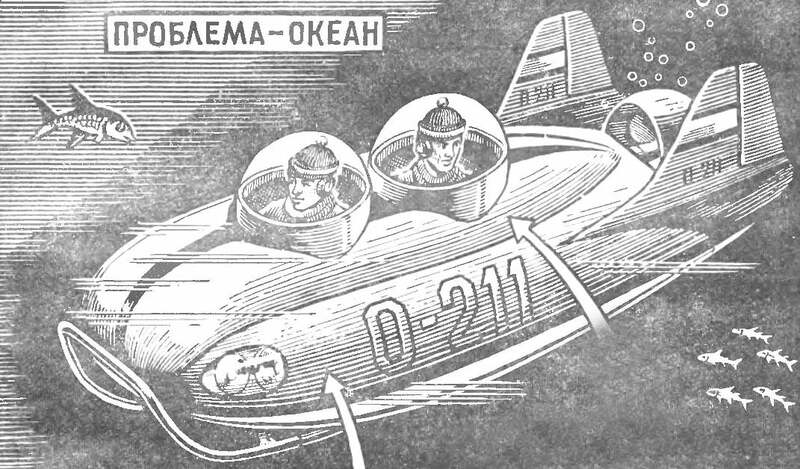 Double submarine “baby” was shown in the autumn of 1967 at ENEA. There are other works in this direction as our and foreign enthusiasts of scuba diving. — The problem mainly is the need to have a series of underwater vehicles, — says the head of the group Alexander Stetsurin. — Devices must differ in mode of operation (Autonomous, towed or self-propelled — powered from an electrical cable), by type (wet dry), features (real interest, multipurpose). In addition, it is necessary to provide opportunities for the development of a series (or a single apparatus) in the future in accordance with the requirements of industrial fisheries and related fields of science. A series of underwater vehicles on the basis of the individual modules and boxes called aquacontroller. Conventionally, we can represent it in the form shown on page 4. Under the assurance system refers to the database of underwater vehicles, forms and means of communication with her, lifting winch device, charging of batteries and power sources, compressors, etc. Platform — the carrier of the device, its base, capsule cabin for accommodation of people and scientific equipment. As we can see, the layout options underwater vehicle from aquacontroller can be very different. Different, of course, will need time to implement them. The authors of the project believe that the Assembly of some of them only need a few hours. One of the guys ways of implementing ideas to create a basic version of the underwater apparatus (e.g. the apparatus “wet” type) capable of operating in three modes, already mentioned above. With the development of this scheme in the future, based on improvements of the basic variant. This direction and took over the tech program creative Komsomol-youth group “Problem—ocean” in Kaliningrad. The first aquacontroller already on the stocks. Guys in a hurry, the timing for the construction of the allotted super compressed: by spring everything should be ready to test. And it’s not just that cleared from the ice of the Baltic sea, and will let you try out the underwater camera in natural production conditions. The pace dictated by another reason: the new work of the youth collective dedicated to the remarkable date in the life of the young Communist League — his seventeenth Congress. This means that no time is simply impossible. Serious guys, words on the wind drops, says the first Secretary of regional Committee of Komsomol Michael Klimko. — These, took a stake, I’ll do. Like all members of the Komsomol, the youth of the area, they are perfectly aware of their role in the Affairs of scientific and technological progress, are able to correlate the plans with the possibilities. Enthusiasm they borrow. These circumstances, coupled with the significant support of the group “Problem — the ocean” the management of SACB create a reliable guarantee of success in scientific and technical creativity of the Komsomol-youth team. And in conclusion. Hardly any of our readers acquainted with this topic, the idea of creating small underwater vehicles, will be indifferent to it. Why not think about how to solve problems together with people? To propose their own, not to argue? The editors and a group of “Problem—ocean” waiting for your opinions, dear friends! Offer, mind, argue! The theme of light underwater vehicles magazine will continue. New and exciting ideas for their creation and construction we are happy to publish in future numbers. Ocean and problems of its development are waiting for their enthusiasts. And not just the ocean. Well if we studied the depth of our external and internal seas, lakes and rivers? Always know how to manage the life of the underwater world, water regime, do we know the Geology of the bottom? These and many other issues will be successfully resolved, if in the case of creating a small underwater vehicles will be included with all their inherent energy enthusiasts equipment and technical creativity.